BAE Systems, the British military contractor that's helped design everything from Navy destroyers to tanks, has just unveiled a new tactical vest that will give operators in the field the aibility to power electrical devices via USB. Not only that, the materials and design processes used could well shape the future of consumer wearables, too. The Broadsword Spine uses a special base material that turns a piece of clothing into a piece of networked technology. Know as an e-textile, the revolutionary material creates an invisible electronic network and power supply, by using conductive fabrics instead of wires and cables. As a result it offers a 40% reduction in the weight carried by an operator, removing the need to carry heavy power supplies. The Broadsword Spine tactical vest is proper military grade stuff too, what with it being fire, shock, water and humidity proof. 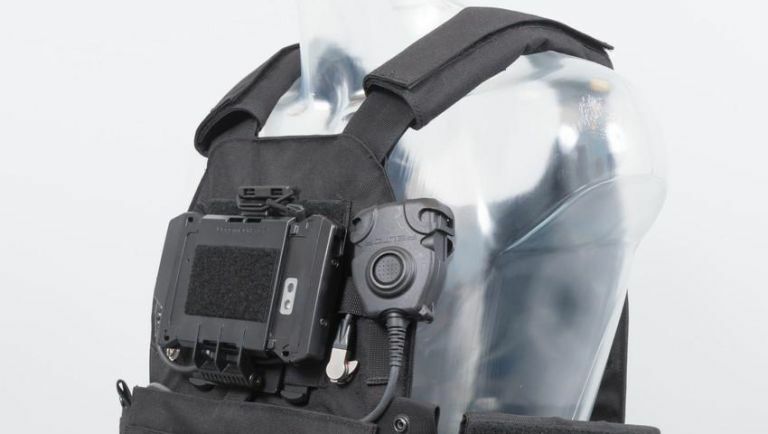 BAE Systems is planning to roll out the vest to armed forces, fire response services and law enforcement in the near future so users can keep radios, GPS devices and cameras powered up on the go. "Broadsword Spine will deliver a lightweight, cable free and better alternative to existing systems," comments Paul Burke, Defence Information and Technology director at BAE Systems Military Air and Information. "It is the first product of our partnership with ITL and uses its revolutionary e-textile allowing power and data to move through fabric." He adds: "It will be more flexible, robust and lighter than the heavy, unwieldy harnesses which are currently used. Broadsword Spine offers an open architecture, meaning it could be used to power communications used by anyone from a soldier on the battlefield to a first responder called to an emergency."